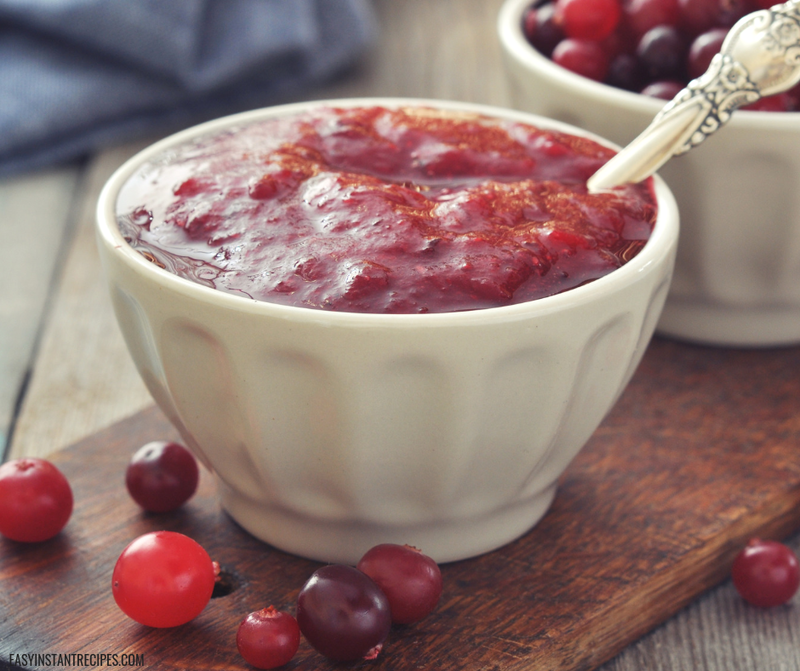 This Instant Pot Cranberry Sauce recipe is ridiculously easy to make. I absolutely adore homemade cranberry sauce. It simply cannot compete with the stuff from a can. However, I hate cooking cranberry sauce on the stove. Cooking cranberries in the Instant Pot is a quick set and forget way to get a delicious cranberry sauce every single time. This recipe is ridiculously easy and pretty hard to mess up. There really are no tips or tricks to go with it. You can even walk away and let your pressure cooker naturally release (instead of the recommended quick release) and still have a delicious cranberry sauce when you open the lid. I would however recommend that if you do that you turn off the Instant Pot’s option to keep warm just on the off chance that it burns. I personally enjoy cranberry sauce with orange juice. If you like your cranberry sauce without orange juice simply substitute the juice for 1/4 cup of lemon water. If you are looking for a naturally sweetened cranberry sauce substitute the brown sugar for one apple (peeled, cored, and diced) with a 1/2 cup of honey. I personally prefer brown sugar, but I promise the apples and honey trick is still delicious. This recipe makes 2 cups of cranberry sauce. Usually when I make this cranberry sauce for a holiday such as Thanksgiving we don’t have left overs. However, if I make it for just a family dinner (we have a family of 7) we almost always have a bit leftover after dinner. The good thing is, cranberry sauce is versatile. It goes great on turkey sandwiches, pork chops, meatballs, or even mixed into a cornbread mix. In a measuring cup or bowl, mix together brown sugar, cinnamon, and orange juice. Add cranberries to the Instant Pot. Pour orange juice mixture over the cranberries. Use a spatula to scrape out any brown sugar or cinnamon left in the bowl. Cover and seal the Instant Pot. Pressure Cook on "Manual/High" for 15 minutes. Once the cranberry sauce is done cooking quick release the pressure. Transfer cranberry sauce to your serving container. It will look thin, don't worry! Allow cranberry sauce to sit until cooled. As it cools it will thicken. Then serve! Not making this cranberry sauce in your Instant Pot right this second? Then pin this post so you can easily find it later!